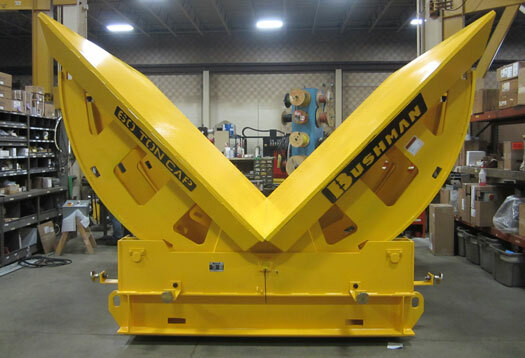 The Bushman Equipment, Inc. mechanical upender provides an easy and efficient way to upend metal coils, molds, dies and other heavy and bulky loads. Mechanical upenders, sometimes called coil positioners, rotate steel, aluminum & other non-ferrous coils and other loads through 90 degrees. They are used in a variety of production and maintenance applications. 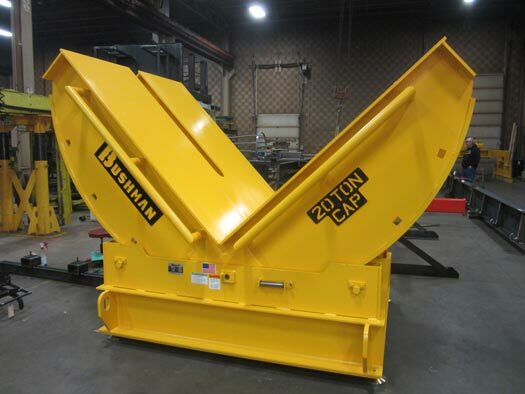 Capacities are available up to 200 tons along with a variety of options. Mechanical upenders are available in standard configurations or may be custom engineered for your particular application. Mechanical upenders have a 3/4 round-shaped cradle that is placed on four machined steel rollers. An electric-powered gear motor driving a single or dual chain sprocket provides the ability to rotate. 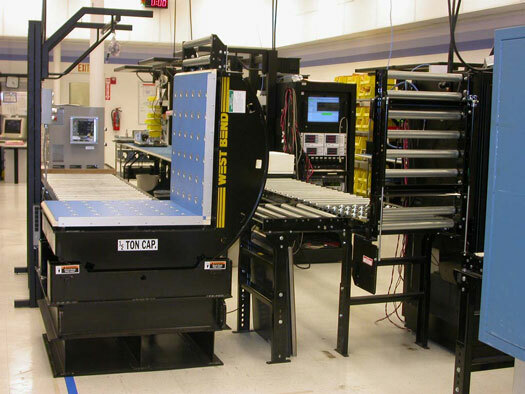 Standard upender capacities range from 3,000 to 100,000 pounds. Robust reinforced welded steel construction. Single or double drive chains dependent on capacity and location of load’s center of gravity. Welded steel trucks with four straight tread, single flanged steel wheels with roller bearings. 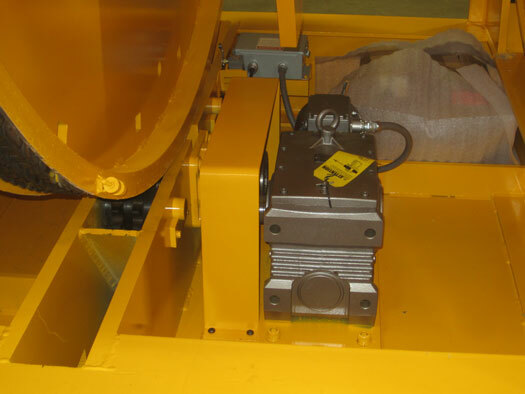 Fully enclosed right angle drive gearbox with single speed motor and disc brake. Output drive open gearset is guarded. The platforms of the upender cradle not only support the load, but are designed to interface with the handling device that sets or removes the load. The basic cradle has two flat platforms. For coil handling, the coil rests on a welded steel V-saddle. The surface of the saddle can be bare steel, or covered with replaceable UHMW or Nylatron pads. 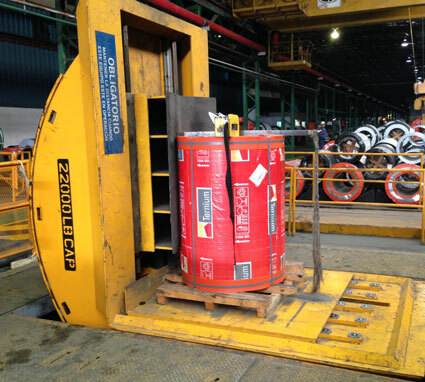 A motorized V-saddle (above right) can gently move a coil and snug it up to the pallet before tipping. This prevents the coil from sliding while it is tipped. 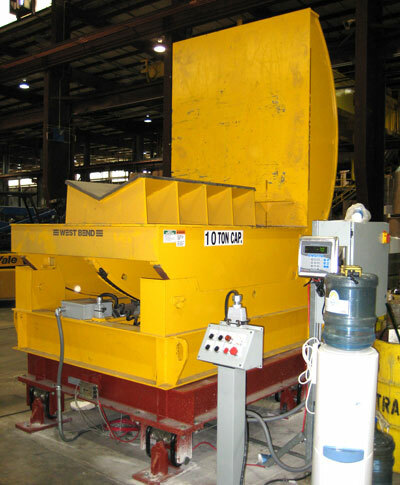 A motorized pallet adjuster helps to center the coil when tipping a wide range of coil diameters. When loading a coil with a crane using a c-hook or motorized coil grab, a slot and/or cutout is needed for interfacing with the upender. Structural set offs can be used to support uniquely shaped loads. Conveyors & ball transfer rollers may be used to load and unload the upender. 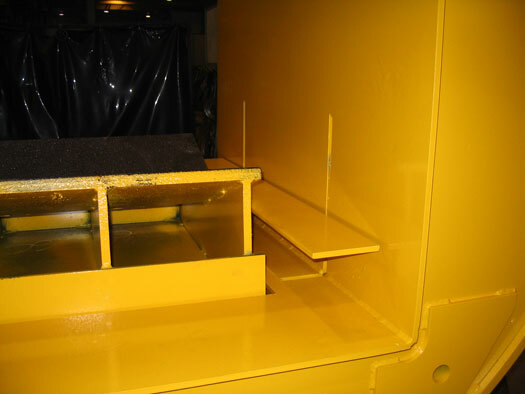 Pit mounted upenders allow the platforms to be flush with the floor to facilitate loading or worker interface. Leveling pads can be provided to ensure a near perfect level platform. A motorized rotating base is used when loading and unloading with a fork truck. The truck does not have to reposition itself after the load is tipped. An upender can be mounted onto a weigh system stand. 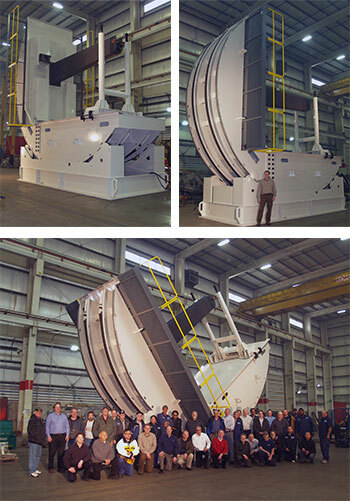 Steel mill upenders tip coils for an annealing process. Note T-slots for tie-down of load. These upenders tip plastic injection molds for clean out and maintenance. This upender is used for specialized machine assembly. It has manually adjustable V-saddles. 25,000 lb capacity upender with machined loading platform. 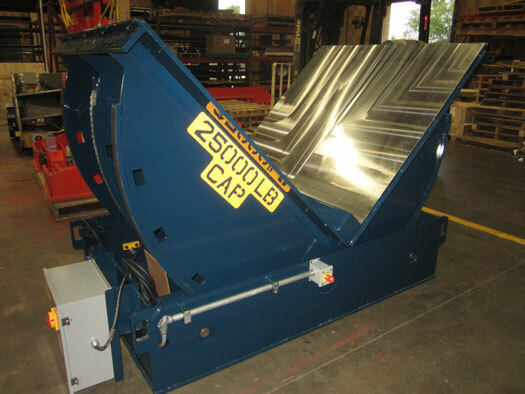 10 metric ton coil upender, pit mounted, with a motorized V-saddle & motorized pallet adjuster. 80 metric ton upender holds utility transformer coils on a cantilevered arm.